Art has the potential to unite different cultures in harmony and to imagine new ways people can live and work together for justice, equality, and peace. Three Cities Against the Wall is an exhibition protesting the Separation Wall under construction by Israel in the Occupied Territories of Palestine. This project involved groups of artists in Ramallah, Palestine; Tel Aviv, Israel; and New York City. The show was held simultaneously in all three cities in November 2005. 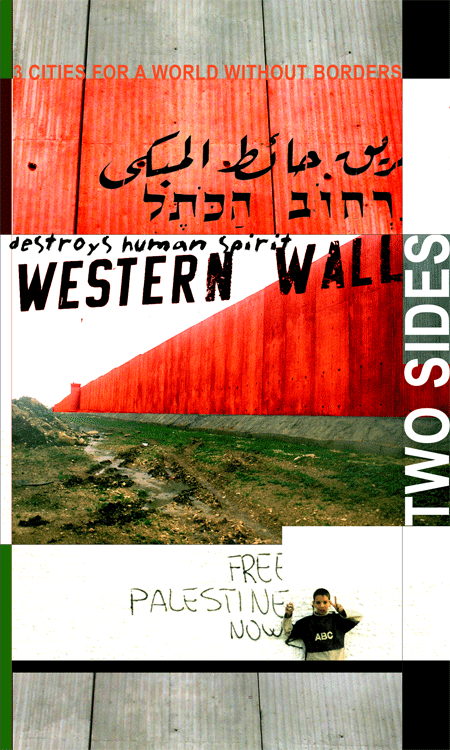 Through this collaborative exhibition, the organizers and participating artists draw attention to the reality of the Wall and its disastrous impact on the daily lives of hundreds of thousands of Palestinians by the separation of Palestinian communities from each other and from their fertile lands, water resources, schools, hospitals and work places, thereby “contributing to the departure of Palestinian populations,” as the International Court of Justice has warned. The wall also destroys the human spirit. Spiritual and cultural life cannot survive under these conditions, and we, as artists, find it necessary to fight this crime with the means we possess. This illegal Wall prevents the possibility of a just solution to the Palestinian-Israeli conflict based on the universal principles of equality and self-determination. It prolongs the conflict and the suffering that results from it. Therefore we Israeli, Palestinian, and American artists call attention to the urgency of dismantling the Wall, which threatens any peaceful future in Israel and Palestine. Curatorial and organizing committees for Three Cities Against the Wall, comprised of local artists and activists, have been established in each of the three participating cities. These committees have each invited numerous artists to participate, each of whom was asked to provide three works, one for each of the three locations. In Palestine, Tayseer Barakat, founder of the League of Palestinian Artists and curator of Gallery Barakat, and the artist and organizer Sliman Mansour organized the exhibition. The organizations involved are the League of Palestinian Artists and the Palestinian Association of Contemporary Art. In Israel the project was organized by a group of artists and activists that came together to resist the Wall through art and culture. Members of the group are associated with the Israeli Coalition Against the Wall, Ta’ayush, and Anarchists Against the Wall. These groups are active in protests and projects, both in Israel and Palestine, against the occupation and the construction of the Wall; many have participated in demonstrations where protesters have been seriously injured - Palestinian, Israeli, and international. In New York, Three Cities Against the Wall was organized through the arts center ABC No Rio by a committee of artists and activists, a number of them associated with the radical comic magazine World War 3 Illustrated. ABC No Rio is a community center for the arts that grew out of housing struggles on New York’s Lower East Side. World War 3 Illustrated was founded in 1979 to oppose the right-wing policies of Ronald Reagan. It has been publishing art and articles in support of the rights of the Palestinian people since 1988, when it published an interview with the Palestinian political cartoonist Naji Al-Ali. Many of the organizers in New York participate in the International Solidarity Movement, Women in Black, SUSTAIN (Stop U.S. Tax-funded Aid to Israel Now), the International Women’s Peace Service, Jews Against the Occupation, and other groups opposed to Israel’s unjust occupation. In the process of creating Three Cities Against the Wall, the organizers and participating artists built networks and forged relationships between their respective communities to oppose Israel’s oppression of the Palestinian people and the Wall as a symbol of that oppression. Yet while American, Palestinian, and Israeli artists are showing their work together in this exhibition, we understand that their relationship is not one of equality. The relationship between Palestinians and Israelis is like that between prisoners and guards, with U.S. citizens as the prison’s patrons. Americans finance Israel through their tax dollars; some also finance Israel through contributions to Zionist organizations. The Wall is horrifying because it casts these relationships in concrete, making Palestinian imprisonment more thorough and more permanent. Ironically, there is also an opportunity created by the Wall: this physical barrier makes the oppression of Palestinians more visible. Artists can use the Wall as a metaphor to educate the public. We are working together because we understand that by uniting our voices we are more likely to be heard and will therefore be better able to inform people about the true nature of this catastrophic situation. We also want to demonstrate that within the Israeli and the American public there is opposition to the Wall. With this exhibit, we are laying the foundation for building a community of artists across borders. And we are demonstrating our joint opposition to injustice and oppression, both on moral and ethical grounds and because injustice and oppression engender a separation between peoples, preventing normal human communication between them.